"Moving forward, I am firmly and fully committing my life to being an NFL quarterback," Murray started in the post. "Football has been my love and my passion my entire life. I was raised to play QB, and I very much look forward to dedicating 100% of myself to being the best QB possible and winning NFL championships." That shuts the door on the possibility he will play for the Oakland Athletics, who made him the No. 9 overall pick in last June's draft. After the draft, Murray signed with the A's and received a $4.66 million signing bonus, a payment he will have to return. Also, The A's will put Murray on the restricted list and retain his rights, but they will not receive a compensation draft pick. 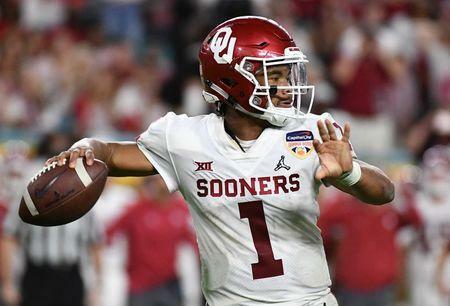 Murray was granted permission to play one final year of football at Oklahoma last fall before reporting to the A's, and he won the Heisman Trophy. Murray, an outfielder, was invited to spring training by the A's. Position players are due to arrive on Friday at the team's spring training complex in Mesa, Ariz. Some NFL mock drafts have Murray being drafted in the first round, and Murray would be the first athlete ever drafted in the first round by both an NFL and MLB franchise, according to ESPN's Field Yates. Aside from the Heisman, Murray's lengthy list of honors include the Manning Award, Davey O'Brien Award, AP Player of the Year, USA Today Player of the Year and Big 12 Offensive Player of the Year. "I have started an extensive training program to further prepare myself for upcoming NFL workouts and interviews," he continued in his social media post. "I eagerly await the opportunity to prove to NFL decision makers that I am the franchise QB in this draft."